The girl, Aaliya Khan (Deepika Padukone) is more believable than the guy, Abhay Gulati (Imran Khan)… she is independent, headstrong, enjoys attention but no intervention; the guy is sensitive, caring, packs her undergarments neatly in her bags and has no life other than her. Childhood romance wanes off for the girl but not for the guy; she dumps him but he follows her to win her back. From being every girl’s dream guy, Imran’s character slips into this spineless creature who is described as an ATM machine in the film as machines only give not ask for something. Deepika’s character earns the title of a cold heated b*tch (courtesy: my fellow movie watchers) to a chudail / witch (courtesy: Pammi Bua played by Lillete Dubey). Both actors try hard but their limited acting abilities and a lacklustre script don’t help; the fun elements in the first half appear repetitive and boring in the second. If the girls watching the film with me found it cute in the beginning, the climax disappointed them also in a big way. Break Ke Baad has a lot of smart lines, some good clothes (and some bad), good locations and an average music score (Vishal Shekhar); the film falters with a thread-bare script, the lack of crackling chemistry between the lead pair and the lamest ending in the recent past. The film has an interesting supporting cast featuring Sharmila Tagore, Lillete Dubey, Shahana Goswami and Yudhishter Urs but that’s not good enough to hold the film together. I won’t write off the film completely as the three girls who watched it with me seemed to like it but it certainly isn’t a film that can make it to anyone’s must-watch list. Well what do I say… doesn’t the film’s title says enough? Boy meets girl, girl believes in candy-floss-romance and the boy hates luv stories (please note, he doesn’t hate love stories, smart!) Directed by Punit Malhotra, the film was produced by Dharma Productions and worked well on the box-office, however I am yet to meet anyone who luved this film. Sonam Kapoor plays Simran, a die-hard romantic whose clothes match her boyfriend Raj’s (Samir Dattani) shirts or vice-versa; she is an art director working on a big ticket romantic flick, directed by a Karan Johar like film maker. Jay (Imran Khan) hates such cinema but is still assisting on the film; he also shows off his newly acquired abs to Bruna Abdullah in a song, to make us believe that he is the new age Casanova. Opposites attract and Simran falls for Jay but Jay hates luv stories, end of chapter one. In chapter two, Jay realises his mistake as he luvs love stories but Simran goes back to Raj who buys her white gerberas daily (remember, daily one red balloon in Dil Chahta Hai?) Chapter three… you know what happens. Punit Malhotra and Sonam Kapoor’s twitter squabble with Shobhaa De after she ripped apart the film in print was more interesting than the film itself. It was Abbas Tyrewala’s next directorial after the hugely successful, Jaane Tu Ya Jaane Na; John Abraham’s first production with music by maestro, A R Rahman. The expectations were sky high with an interesting working title, 1-800-LOVE. 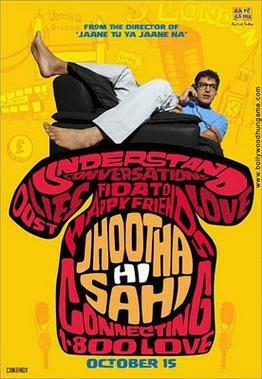 The film eventually came out as Jhootha Hi Sahi and all the expectations came crashing down. The music did not work very well (though I like the Cry Cry song) and everyone wondered who this mature actress opposite John is? She turned out to be the director’s wife who was also credited for the script – Pakhi Tyrewala. After all, it is all about loving your family, eh… wife. The film tried to recreate the magic of American sitcoms like Friends and How I Met Your Mother but somehow couldn’t manage to get the same chilled out feel on-screen largely due to the weak screenplay. Having said that, I love the way London’s beautiful summer is captured in the film. Two suicidal protagonists, Aakash (Ranbir Kapoor) and Kiara (Priyanka Chopra), who decide to have some fun in the last few days of their lives and end up falling in love. They are both poor but wear trendy clothes, visit hep night clubs at New York’s Times Square and Las Vegas… I quite like their lifestyle actually! They try to die by wrapping cling-wrap around their faces (now you know why it isn’t a toy, keep it out of reach of children) and jumping off a bridge, but they don’t. Fifteen minutes into the film, you start praying for them to die so that the film gets over but they don’t; instead Zayed Khan is also unleashed by director, Siddharth Anand on us to increase the Chinese torture. Both Priyanka and Ranbir are good actors and promising stars but they should look hard at the scripts they choose. Siddharth Anand on his part is creating a library of mediocre rom-coms. As a policy I cannot comment on a film I haven’t seen; and I could not drag myself to the theatre for this one after watching the trailers only, despite all my love for Yash Raj Films. 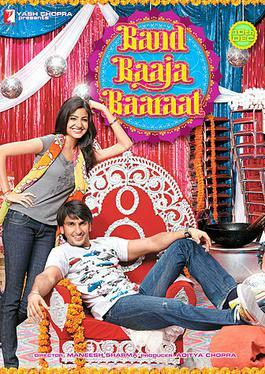 Band Baaja Baaraat is the last rom-com to hit the screens before the year ends, am hoping the year ends on a bright note for this genre. PS: Don’t think that I don’t like romance / rom-coms as a genre; I am just a disappointed film buff. Click here to read my earlier post on the best romantic films according to me.